You’ve been busy decking the halls, baking the cookies and wrapping the presents. You also feel guilty because in all the hoopla of the holidays, your pet hasn’t been included in the festivities. Every time you fly through the family room on the way out the door, you tell yourself that you’ll find the time to take him for a walk or break out the catnip toys. Pets often do feel neglected during the rush of the holidays. Add to that the upheaval in schedules and lots of visits from people they may not know, and you have a recipe for a pet who acts out of frustration or is simply miserable. There is hope – there are lots of ways to include your pets in the holiday festivities and make the most of the time you have. Choosing the perfect tree is usually a family affair, so grab the leash and bring your dog along with you. A Christmas tree lot or tree farm will be a thrill for your dog – lots of new scents, people to watch, and that special giddiness most humans only share at Christmas! Just be sure to call ahead to make sure dogs are welcome and bring some cleanup supplies in case Fido decides to fertilize the farm himself. Most communities have a “Light Up Night” in their downtown with vendors, food trucks and lots to see and hear. Take your pet with you and let him or her sniff out all those wonderful holiday aromas. You can take a leisurely stroll with them and get some shopping done at the same time. If you live in a neighborhood where friends and neighbors use lots of colored or twinkling lights, the evening stroll can be an exciting one for your pet. Take a different path each evening so your pet can see all the colorful displays and bark at the ones that move (if he’s into that). You’ll discover that a slow stroll through your neighborhood will also be refreshing for you. The beauty of twinkling lights on a snowy night can’t be duplicated. 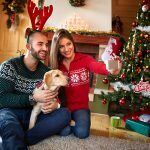 Create fun, Christmas family portraits with your dog. Holiday cards featuring a family photo are popular, and many families include their pets. This year, skip the formality and use a candid photo instead of a studio portrait. Keep it light-hearted and fun. Encourage the kids to play with their pets and snap away. Alternatively, do something unexpected like putting antlers on everyone’s head or wearing matching ugly sweaters (we trust you to figure out how to get the sweater on the cat). You’ll end up with a priceless photo that will bring a chuckle to your family and friends while including your pets in the holiday festivities. You’ve probably already scheduled your pet for a grooming a few days before your holiday festivities, but have you asked the groomer to give them some extra attention? Ask them to add a pet massage, manicure or some other service to make your pets feel extra special. Include your pets in the holiday festivities. Make holiday pet treats together. Everyone has their favorite holiday cookie and you’ll probably be baking up a storm to make sure everyone gets their favorite. Don’t forget to make a batch of holiday treats for your pets. You can find lots of dog and cat friendly cookie and cupcake recipes on the Internet. You can even make up an extra batch or two for friends’ pets and help your pet deliver them! Visit your local craft shop or shop online and buy an inexpensive holiday ornament making kit that lets you personalize Christmas decorations with photos of your pet, a paw print, etc. Many of these are easy enough for even young children to help you create keepsakes you’ll use year after year. Before wrapping your dog’s or cat’s gift in shiny paper, scent it so your pets will know instantly which gift is theirs. You could tape a few dog treats to the box or include a catnip mouse in the gift bag to entice your pet to rip open their gifts with enthusiasm. Just don’t put it under the tree until right before the gift exchange is supposed to start, or they’ll be done unwrapping their gifts before anyone else starts! Why shouldn’t your pets have their own stockings? You’ll be amazed by the variety of stockings available for pets of all shapes and sizes. You can even personalize them with names. Christmas morning, they’ll love to stick their noses into their stocking and pull out little stuffed toys, treats and whatever else is tucked inside. Whether it’s a quick stop at a neighbor’s house to have coffee or a family get-together at Grandma’s, take your pets with you so that they can soak up some of that Christmas spirit. They’ll feel more like family if they can come along when you’re making the rounds. Of course, always call first to make sure that the company of your pets will be welcome. Include your pets in the holiday festivities – including cat naps when needed! When you’ve been rushing here and there for days or weeks at a time preparing for the holidays, a nice, long nap is a welcome way to recharge your batteries. When you decide to lay down and get some much-needed sleep, invite your dog or cat to cuddle up with you. They’ll love having you all to themselves for a few minutes or hours, and snoozing together is a wonderful way to strengthen your bond. Studies show that sleeping with your pets can lower your blood pressure, a bonus for you. Many pet shelters and humane societies allow families and their pets visit during specified hours. It will give your dog or cat any opportunity to help socialize any new animals. Take some donations such as dog or cat food, blankets, cleaning wipes and towels. Shelters and humane societies are perpetually low on these crucial items, particularly at the holidays. Make sure to check with any place you want to visit and arrange a time that is convenient for the staff and the animals. 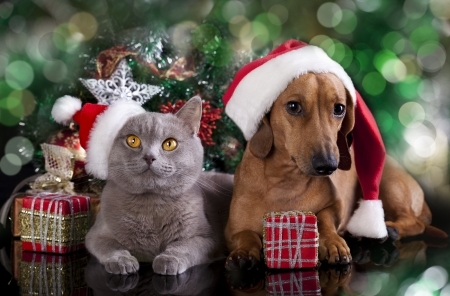 When you include your pets in the holiday festivities, you can include their friends as well. Christmas and Hanukkah are both winter holidays, when the nights are long, and the weather is often miserable. Many dogs and cats are tired of being stuck inside and have excess energy to burn. The solution? Throw a little holiday party for your pets’ best friends. Invite their dog park buddies, neighboring pets and litter mates to your place for some dog treats (home-baked! ), some play time and lots of belly rubs. If your house is too small to accommodate the group, consider using your garage for the day. If the temperatures are bitter, a few space heaters can do the trick (always supervised, of course!). Visiting Santa is one way to include your pets in the holiday festivities. Every good dog (and aren’t they all good dogs?) and cat dreams about getting a new chew toy, a spiffy collar and some treats for Christmas. Take your pets to see Santa Claus so they can let the big guy know what they really, really want. 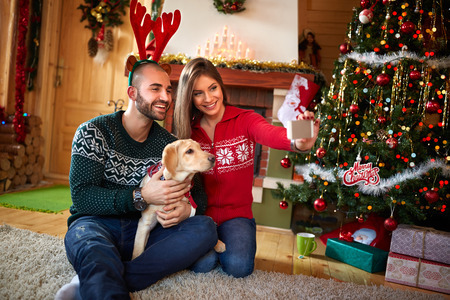 There’s no better way to include your pets in the holiday festivities. 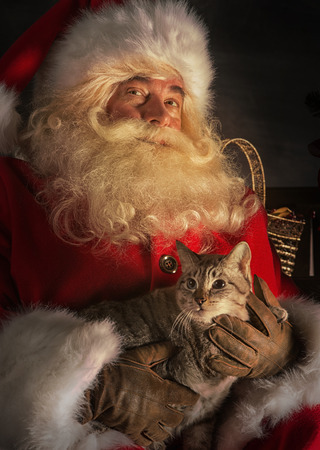 As a bonus, you can get a great picture of your pets with Santa to proudly display. 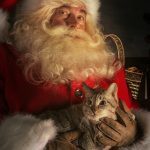 Check with local pet supply stores, charities and other organizations to find out which ones allow dogs and cats to pose with Santa. The resulting photo just might end up going out in your holiday cards! Kittens are always a concern when you have a live tree. Ours got knocked over two Christmases in a row before my husband came up with a solution. He screwed a plant hanging hook into the ceiling above the tree, then tied a fishing line to the top of the tree and attached it to the hook. We haven’t had a tree fall over since! When it’s not the holidays, we just hang an ivy plant there. This is such an adorable post! I’m going to tweet it, too. I especially like 12. It’s so easy to get so caught up in all the holiday activities (and sometimes stress) that we forget to take some quiet time for ourselves and our pets. So important! Thank you so much! I always try to take an afternoon nap with Soldier and Peanut Butter. One lies next to me, the other drapes herself over my feet. It’s a wonderful way to de-stress. I love all of your ideas and suggestions for getting our pets involved in the holidays! We always include our pets – they are family after all! They all get their own gifts and stockings too! Great ideas and you’re absolutely right. There are so many easy ways to include our furry companions in the festivities. After all they’re part of the family so why shouldn’t they join in the fun. I love the idea of inviting pet friends over for a holiday get together and of course having their own stockings! We had our cat Peanut for 18.5 years and she HATED Christmas with an absolute passion!!! It disrupted her routine with us, AND we did things out of order AND stayed home (shock horror). After three days we would get the stink eye and have to go out shopping because she made us think she was suffering because we were home!!!! LOL, Yes, cats can certainly develop an attitude when their routine is disrupted. Our cat (Peanut Butter!) doesn’t like when we rearrange the furniture to put the tree up. The chair isn’t in the right place for her to catch the sunlight during her naps. How rude of us! Love this list. We do several of them already, but also some great new ideas. Thanks for sharing. These are some great ideas! I’m currently in mid-search for a dog friendly tree farm. It’s crazy how many of the are not. I guess they worry the boys will pee on all the trees?? We love including our dogs in as many Christmas traditions as we can and they all get their own stocking full of goodies and their own christmas cookies. The cat too! We don’t get that festive up here. Our main goal is spending as much quality time together as possible and eat some good, shareable, food. Special, extra walks, stuff like that. Dogs always appreciated that way of celebrating things. These are cute ideas. I just saw this past weekend, a sign near the PetSmart in town that Pet photos with Santa were taking place for free. Great way to make holiday memories with Fluffy. I love the pet party idea too. That’s clever and different. Thanks for the heads up on the free photos at PetSmart. I checked the local one here and they are offering that as well. I love this list. I’ve done some of them, like taking my dog Christmas tree shopping and walking around the neighborhood looking at lights, and of course, presents. I like the Christmas dog party idea, and visiting Santa! I love the throwing a holiday party for your pet’s friends. So cute. Our dogs have stockings and get to open their gifts first thing Christmas morning. It keeps them busy while we’re opening our gifts. usually we have a full house staying with us over the holiday, which means chaos (Think Christmas Vacation). This year, we have no guests and can just be a family. The dogs will be much happier I think. I love the Christmas Vacation analogy! We’ve been there as well. The chaos was total, but so was the fun. I’m sure your dogs will love having your undivided attention this Christmas! These are fun ideas. My dogs seem to really enjoy everyone being together on Christmas morning, even if they don’t get presents. Please don’t allow dogs to mark the Christmas Trees if you take them to pick out the family tree, that will be no fun to smell that during the holidays for whoever chooses that tree. 🙂 And also be mindful of transmittable diseases if you take your pup to visit the shelters, best to leave them home and change your close plus disinfect shoes after visiting shelters so as not to further spread the nasties. As long as people are safe and smart during the holiday season this list is great. I love to involve the pets in funny pictures. I would never dream of allowing any dog to mark a Christmas tree, whether it is in the field or in the house. I’m assuming that most dog owners are responsible enough to visit a tree farm. Ours have gone for decades without a problem. Obviously, if someone’s dog can’t behave, he shouldn’t go. The same for visiting a shelter. I suggested calling ahead and making arrangements that work for the shelter for a variety of reasons. If a shelter has an outbreak of something, they will inform visitors. Most shelters in our area welcome visiting dogs because it helps socialize them to new dogs and people. They always provide shoe covers and remind us to wash our clothes when we get home. My dog would mark every tree he could find .. males. I take him to see Santa, though, if there are photos. Otherwise, I stay clear of ‘holiday’ chaos. LOL, it’s a good thing dogs don’t mark people – Santa would not be amused!